Background: Short birth intervals are associated with increased risk of adverse maternal and neonatal health (MNH) outcomes. Improving postpartum contraceptive use is an important programmatic strategy to improve the health and well-being of women, newborns, and children. This article documents the intervention package and evaluation design of a study conducted in a rural district of Bangladesh to evaluate the effects of an integrated, community-based MNH and postpartum family planning program on contraceptive use and birth-interval lengths. Intervention: The study integrated family planning counseling within 5 community health worker (CHW)-household visits to pregnant and postpartum women, while a community mobilizer (CM) led community meetings on the importance of postpartum family planning and pregnancy spacing for maternal and child health. The CM and the CHWs emphasized 3 messages: (1) Use of the Lactational Amenorrhea Method (LAM) during the first 6 months postpartum and transition to another modern contraceptive method; (2) Exclusive, rather than fully or nearly fully, breastfeeding to support LAM effectiveness and good infant breastfeeding practices; (3) Use of a modern contraceptive method after a live birth for at least 24 months before attempting another pregnancy (a birth-to-birth interval of about 3 years) to support improved infant health and nutrition. CHWs provided only family planning counseling in the original study design, but we later added community-based distribution of methods, and referrals for clinical methods, to meet women's demand. Methods: Using a quasi-experimental design, and relying primarily on pre/post-household surveys, we selected pregnant women from 4 unions to receive the intervention (n = 2,280) and pregnant women from 4 other unions (n = 2,290) to serve as the comparison group. Enrollment occurred between 2007 and 2009, and data collection ended in January 2013. Preliminary Results: Formative research showed that women and their family members generally did not perceive birth spacing as a priority, and most recently delivered women were not using contraception. At baseline, women in the intervention and comparison groups were similar in terms of age, husband's education, religion, and parity. CHWs visited over 90% of women in both intervention and comparison groups during pregnancy and the first 3 months postpartum. Discussion: This article provides helpful intervention-design details for program managers intending to add postpartum family planning services to community-based MNH programs. Outcomes of the intervention will be reported in a future paper. Preliminary findings indicate that the package of 5 CHW visits was feasible and did not compromise worker performance. Adding doorstep delivery of contraceptives to the intervention package may enhance impact. After a live birth, wait at least 24 months before attempting the next pregnancy to reduce the risk of adverse maternal, perinatal, and infant outcomes. After a miscarriage or induced abortion, wait at least 6 months before attempting the next pregnancy to reduce risks of adverse maternal and perinatal outcomes. Newborns can be born too soon, too small, or with a low birth weight. Infants and children may not grow well and are more likely to die before the age of 5. Mothers may die in childbirth. Mothers are at higher risk of developing anemia or premature rupture of membranes. Reduced risk of preterm births, low birth weight, small for gestational age, and, in some populations, stunting or underweight conditions. Reduced risk of death for newborns, infants, and children under 5. Increased chance that children will experience the health benefits of breastfeeding for a full 2 years. More time to prepare physically, emotionally, and financially for the next pregnancy (if desired). For young mothers, reduced risk of pregnancy-induced high blood pressure and associated complications, obstructed or prolonged labor, iron deficiency anemia, and maternal death. More time to focus on infant, partner, and other children. Reduced risk of pregnancy complications, such as preeclampsia. May increase duration of breastfeeding, which is linked with reduced risk of breast and ovarian cancer. Helps men safeguard the health and well-being of their partners and children. Allows men time to plan financially and emotionally for their next child (if desired). Contributes to a man’s sense of satisfaction from supporting his partner in making healthy decisions regarding raising a healthy family. Reduces deaths and illnesses among mothers, newborns, infants, and children. Helps to reduce poverty and improve the quality of life among community residents. Short birth intervals are associated with poor maternal and newborn health outcomes. A 2012 Cochrane review did not find any integrated family planning and maternal, newborn, and child health program in a developing country that had operationalized the growing evidence on the role of family planning in improving child and maternal health (by strengthening counseling on the benefits of longer birth-to-pregnancy intervals, for example).22 Although the review noted that improvements in mortality and morbidity outcomes did occur in some integrated programs, the studies did not document clearly the implementation and program design details. Many postpartum women have an unmet need for family planning. Nonetheless, the presence of government-run health and family planning facilities and exposure to family planning messages in the media in Sylhet division are comparable with other parts of Bangladesh. However, women's access to clinical family planning services in Sylhet district is severely constrained. One-quarter of the public-sector positions slated for provision of clinical family planning services are unfilled (personal communication with Mr. Kutub Uddin, Divisional Director of Family Planning, Sylhet Division, Ministry of Health and Family Welfare, Aug 2012). When clinical family planning services are available, they are offered only at specific times during the week. Nongovernmental and private-sector providers also largely lack clinical skills in family planning. Equally important, in Sylhet, cultural norms restrict women from leaving their homes without a chaperone. Interviewers transcribed and coded the interview and focus group discussions, and the research team reviewed the transcripts and codes to identify themes and relevant findings. When religious leaders understood that family planning was being integrated to support women's and children's health, they stated that they had no objection to this activity. All 40 of the mothers and mothers-in-law that participated in the free-listing exercises were able to list at least 4 risks to either the mother or child associated with closely spaced births. Similarly, 38 of the 40 participants were able to list at least 3 benefits associated with a healthy birth-spacing interval, including physical, emotional (less mental stress), and economic benefits. Nearly 78% of recently delivered women said that they desired a birth-spacing interval of 3 years or longer. During in-depth interviews, some men stated an economic interest in spacing births, and some were also aware of the physical toll that closely spaced births would have on the health of the mother. Respondents generally did not perceive birth spacing as a high priority relative to other family needs. Mothers-in-law considered birth spacing of secondary importance to the provision of grandchildren, which they saw as a necessary and critical obligation of their daughters-in-law. Mothers themselves also said that birth spacing was not a very serious issue for them. Having many children within short intervals is common and perceived as normal in their communities; as a result, the women had not questioned the practice previously. Many of the husbands interviewed considered birth spacing as more important to their wives than to them. Community members could identify benefits of longer birth intervals, but birth spacing generally was not a high priority for them. Despite recognition of the risks of closely spaced births and the benefits of longer intervals, nearly 75% of the recently delivered women (who were not sterilized) were not using any contraceptive method to prevent pregnancy. Provides integrated family planning and MNH services, drawing upon existing cadres of community health workers (CHWs). Each CHW serves a population of about 4,000, or 4 villages. The CHWs are young women from the local community with grade 10 education. All CHWs in both intervention and comparison areas received 21 days of basic MNH training, including skills development for behavior change communication, clinical assessment of neonates, and hands-on clinical training under supervision in a tertiary care hospital and in households. CHWs in the intervention area received an additional 3 days of training about healthy timing and spacing of pregnancy and postpartum family planning, including LAM, and 4.5 days of training about contraceptive methods and logistics management, according to protocols from the government of Bangladesh. In the existing Projahnmo MNH program, CHWs visited pregnant and postpartum women 6 times during the antenatal and postpartum period. They also made 1 visit every 2 months within their catchment area to identify pregnant women. In the intervention area, the HFS integrated postpartum family planning counseling within 3 of the 6 existing MNH visits: at 30–32 weeks of pregnancy, 6 days postpartum, and once between days 29–35 days postpartum. The study also added 2 more visits, at 2–3 months and 4–5 months postpartum (Table 1), to educate families about postpartum family planning and provide services as needed. We designed 3 family planning interventions specifically to support improvements in newborn and child health. The purpose was to ensure that adding family planning activities to the existing MNH services did not undermine program achievements to date in newborn health outcomes. Use of LAM during the first 6 months postpartum to prevent high-risk pregnancies. LAM can be considered a maternal and child survival intervention because its use prevents high-risk pregnancy during the critical 6-month period after a birth. A recent meta-analysis showed that infants conceived during the first 6 months after a live birth are at elevated risk of multiple adverse outcomes.14 Studies in multiple settings have shown LAM to be 98% effective, including with limited client contact.26-28 In addition, a multicenter study found that two-thirds of LAM users eventually accept another modern contraceptive method.28 In this largely rural region of Sylhet, where women's access to health facilities and to modern contraception is highly constrained, the HFS team decided to promote LAM use as a “gateway” method of family planning to address unmet need and to prevent high-risk pregnancies during the critical 6-month period after a birth. In the HFS intervention areas, CHWs always referred to LAM as “LAM and Transition,” emphasizing the importance of transitioning at 6 months postpartum to another modern method. Use of LAM to increase the duration of exclusive breastfeeding and improve breastfeeding practices. LAM use is associated with improved exclusive breastfeeding practices. At the time of the HFS design, the median duration of exclusive breastfeeding in Sylhet division was less than 1 month (0.7).29 Although LAM requires women to be fully or nearly fully breastfeeding, the HFS team decided to communicate the breastfeeding criterion of LAM as exclusive breastfeeding, to prevent the possibility of undermining exclusive breastfeeding practices promoted by the ongoing MNH program. The team hoped to replicate results achieved in Jordan, where one study found that use of LAM promoted good exclusive breastfeeding practices.30 The team also hoped that promoting use of LAM would increase the duration of exclusive breasfeeding. LAM is often referred to as a “gateway” method of family planning, because many LAM users eventually accept another modern method. Postpartum care: A pictorial description of postpartum services and potential postpartum complications, and the importance of visiting a health center at the sign of any complication. The leaflet also emphasizes visiting a health center for a postpartum physical check-up, for immunization of the baby, and to choose a contraceptive method. Exclusive breastfeeding and birth spacing: Describes exclusive breastfeeding, the benefits of birth-to-pregnancy spacing of at least 24 months, the citation from the Quran about breastfeeding, and visiting a health facility for consultations. LAM: A pictorial listing of LAM criteria and when to transition, and the importance of timely transition, to another modern method when LAM is no longer effective. Return to fertility: Describes the story of a woman named Asma; the story discusses the short time period before fertility returns after delivery, and variations in return to fertility from woman to woman, including messages describing the risk of becoming pregnant prior to the return of menses and as soon as 1 month postpartum if the baby is not breastfed, as well as the benefits of birth-to-pregnancy spacing of at least 24 months. The story was received well by women in the study, many of whom could relate to it. In the original study design, CHWs provided family planning counseling based on women's fertility intentions—whether and when women would like to have another child, or whether they would prefer to end childbearing—but they did not distribute contraceptive methods. There was demand among women for contraceptives but they had difficulty accessing them from health facilities. After receiving approval from the JHU Institutional Review Board in July 2009 to amend the study protocol, the HFS team began training CHWs to distribute combined hormonal contraceptive pills and condoms, in accordance with Bangladeshi government protocols for in-home provision of contraceptives by community-based workers. That is, CHWs provided pills only after they completed verbal screening for medical eligibility to rule out risk factors that would preclude the woman from using the method. (The progestin-only pill is the preferred oral contraceptive during early breastfeeding; however, it was unavailable in Bangladesh until approximately January 2011 when it was introduced through private-sector health services.) CHWs distributed pills and condoms during their routine pregnancy surveillance visits every 2 months. Community-based distribution of contraceptives was added to the study design to meet women's demand. Beginning in March 2011, CHWs also started providing progestin-only injectable contraceptives to women enrolled in the HFS. Women must receive the injection every 3 months, but they have a window period and can receive the injection up to 2 weeks early or up to 4 weeks late (according to government of Bangladesh protocol and international guidance34-35). CHWs maintained a list of all injectables users in their planning book, in which they noted the injection receipt date and the next scheduled date. During their regular pregnancy surveillance visits in the community or during community visits for antenatal or postpartum monitoring, CHWs provided injections to injectables users if the dates matched. CHWs also made active referrals for clinical contraceptive methods—that is, CHWs accompanied women desiring clinical methods to the facility. In addition to the one-on-one counseling provided by CHWs, male and female community mobilizers organized monthly meetings at the cluster level with pregnant and postpartum women, their husbands, mothers-in-law, and fathers-in-law to discuss the importance of birth-spacing practices and postpartum family planning, including LAM and return to fertility after delivery. At the meetings, the mobilizers recognized women who practiced LAM successfully, some of whom were designated as “LAM Ambassadors.” LAM Ambassadors provided information and support to pregnant and postpartum women in their communities about the value of LAM. Their healthy and well-spaced babies appeared to be an effective advertisement for the healthy family planning behaviors advocated by HFS. 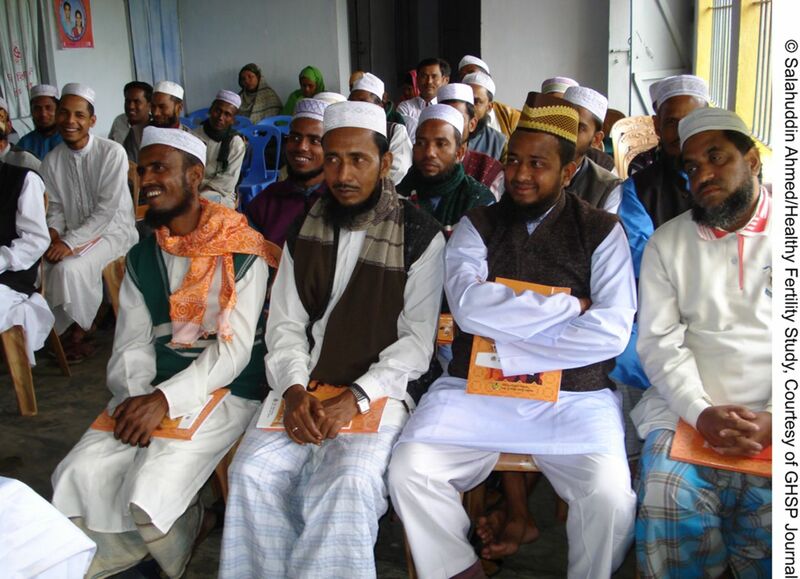 Community mobilizers also conducted advocacy meetings with local leaders, including religious leaders, teachers, businessmen, government, and NGO staff, to sensitize the community about study activities. The Healthy Fertility Study used successful LAM users, designated as “LAM Ambassadors,” to promote LAM to other pregnant and postpartum women in their communities. In December 2007, enrollment of pregnant women began in 4 unions that had ongoing maternal and neonatal health programs. (A union is the lowest administrative unit with, on average, a population of 25,000 people and a primary health care facility.) We intended to enroll women over a 7-month period (through June 30, 2008), but we received additional funding that allowed us to increase the study area to 8 unions, thus expanding the enrollment period through July 14, 2009 (Figure). Abbreviations: HFS, Healthy Fertility Study; PP, postpartum. Using a quasi-experimental design, and relying primarily on pre/post-household surveys among study participants, we purposefully selected 4 unions to receive the intervention and 4 other unions to serve as the comparison group, receiving standard maternal and newborn care promotion only. The study was approved by the Johns Hopkins University (JHU) Institutional Review Board and the Bangladesh national ethics committee of Bangladesh Medical Research Council and is registered as a Clinical Trial (Identifier: NCT01702402). During the Healthy Fertility Study, community mobilizers met with religious leaders during advocacy meetings. Following recommendations from the 2005 WHO Technical Consultation on Birth Spacing,32 this intervention promotes knowledge and use of contraceptive methods to increase birth-to-pregnancy intervals to at least 24 months (equivalent to a birth-to-birth interval of 33 months, or almost 3 years) to improve newborn, infant, child, and maternal health outcomes. Although birth-to-birth intervals can be measured more accurately than birth-to-pregnancy intervals, from a programmatic perspective, it is easier to communicate messages about birth-to-pregnancy intervals, because women and their partners think in terms of the time from the birth of one child to the conception of the next child. Thus, the household survey questionnaires refer to birth spacing in terms of birth-to-pregnancy intervals. However, birth-to-birth interval is the study's primary outcome measure. To calculate sample size, we hypothesized that the proportion of women having another birth within 33 months of the last birth will be 12% in the intervention area and 16% in the comparison area—a 25% difference. To measure a 25% decrease in the proportion of women with a birth interval shorter than 33 months with 80% power and 5% significance level required a sample size of 1,181 pregnant or postpartum women per study arm. Taking into account a design effect of 1.5, we estimated we would need to increase the sample size to 1,772 women per study arm. We assumed a 20% loss to follow-up (10% per year), which further increased the sample size to 2,215 per arm (4,430 total). This sample size is sufficient to measure hypothesized changes in contraceptive knowledge and use and birth-to-birth intervals of 33 months. The total number of women enrolled was 4,570, slightly higher than anticipated as a result of ongoing field operations in several locations simultaneously (n = 2,280 in intervention group, n = 2,290 in control group). The final study cohort was comprised of 4,504 women (2,247 in intervention and 2,257 in control group) for whom data on pregnancy outcomes were available. Community health workers provided doorstep delivery of oral contraceptive pills and other modern methods to women in their communities. In addition to the independent data collectors, CHWs also collected data used to evaluate the intervention, including date of birth of newborns, birth weight, and neonatal outcomes. A separate team of data collectors conducted verbal autopsies of all reported infant deaths occurring in both study arms. Women in the intervention and comparison groups were similar in terms of age, husband's education, religion, and parity (Table 2). Women's education was slightly higher in the intervention group than in the comparison group. Levels of ever-use of contraception were slightly lower in the intervention group (18%) than in the comparison group (21%), and fertility desires were slightly higher (wants more children) (60% versus 56%, respectively). Women in the intervention group were comparatively poorer than women in the comparison group, but the difference was not statistically different (P = .10). There was no difference in coverage of women by CHWs in the intervention versus control groups (Table 3). During pregnancy, CHWs visited more than 99% of women in both study groups. During the first 3 months postpartum, CHWs visited about 96% of women in the intervention group and 93% of women in the control group. However, within the first week of delivery, CHWs visited comparatively fewer women in the intervention group than in the control group (89.8% versus 96.4%, respectively; P<.05). Still, the mean number of CHW visits was higher in the intervention than in the control group (4.2 versus 3.5, respectively; P<.01). This was not unexpected since CHWs provided contraceptive methods to women in the intervention group, which probably required additional CHW visits for resupply of methods. This article describes the design of an operations research study that integrates postpartum family planning education and services within an existing community-based maternal and newborn care program in a low-resource setting. Results of the study described in this article are currently being analyzed and will be published in a future paper. The HFS intends to fill a gap in the literature on postpartum family planning by providing guidance about a scaled-up package of integrated community-based care, including about the appropriate number and timing of CHW household visits. Our postpartum family planning intervention package included 1 antenatal visit and 4 postpartum visits during the first 5 months postpartum, plus 1 visit every 2 months for pregnancy surveillance and contraceptive distribution. 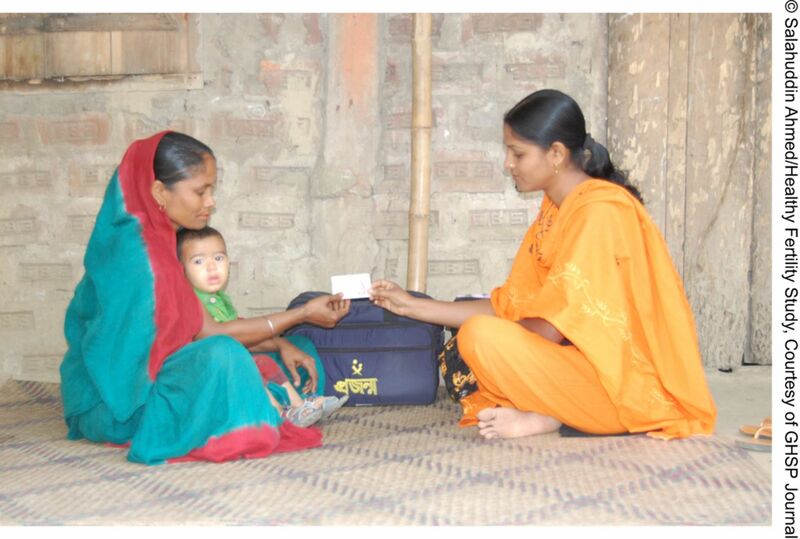 One antenatal and 3 postpartum visits are feasible and sustainable in many community-based MNH programs, including in Bangladesh. For example, the Maternal and Child Health Integrated Program (MCHIP) in Bangladesh funded by the U.S. Agency for International Development (known as the MaMoni project) is implementing an MNH program in 2 districts that involves 3 postpartum visits with integrated family planning counseling and services. Although the 5 CHW visits in the HFS intervention package may be considered intensive, preliminary results indicate that the large majority of women received the full number of scheduled visits and that the schedule did not compromise worker performance. Based on programmatic experience, the HFS team concluded that fewer visits would lead to gaps in continuation of breastfeeding and the transition from LAM to other modern contraceptive methods. Although making 5 CHW visits may be considered intensive, preliminary results indicate it was feasible. Doorstep delivery of contraceptives was not originally part of the HFS intervention package. The government of Bangladesh had moved away from community-based distribution of contraceptives toward clinic-based provision of family planning services.39-41However, HFS-enrolled women began requesting contraceptives from CHWs, and so we added contraceptive distribution to the study design as an opportunity to potentially enhance intervention impact. In this culturally conservative area, women's movement outside the home is curtailed, even more so than in other areas of Bangladesh, which limits their contraceptive access. The HFS builds on important lessons from the Bangladesh Matlab Family Planning–Health Services Project42 and the Navrongo research in Ghana43—both of which provided integrated family planning and maternal and child health services—but focuses on previously neglected areas and new emerging public health issues. The HFS relies on service delivery through locally recruited CHWs with a grade 10 education. In contrast, the Navrongo project achieved results by using more highly educated health care professionals—nurses—a cadre not widely available in many developing countries. The Matlab project demonstrated progress in improving contraceptive continuation rates,5 but first-year discontinuation rates are still high in Bangladesh. At the time of the HFS design, 1-year contraceptive discontinuation rates had increased from 49% in 2004 to 57% in 2007.3 The HFS evaluation is examining the extent to which the intervention motivates women to continue using family planning for at least 2 years without interruption. Matlab made progress in helping women to space their pregnancies, yet currently in Sylhet, 47% of second-order and higher births are spaced less than 36 months apart, and for the 15–19 age group nationally, this percentage rises to 80%.6 HFS communication messages focus specifically on preventing high-risk pregnancies by increasing birth-to-pregnancy intervals, in part through use of LAM—a method for which efficacy studies were carried out only relatively recently, between 1997 and 2000. Thus, LAM was unavailable when Matlab and Navrongo were carrried out. Navrongo demonstrated reductions in child mortality,43 but by the 1990s under-5 mortality in most developing countries was increasingly dominated by newborn mortality, which called for a different set of interventions. HFS includes interventions to reduce newborn and infant mortality by focusing on the 1-year extended postpartum period. The HFS design adds postpartum family planning education and services into an ongoing and successful maternal and newborn care program, whereas with the Matlab project, maternal and child health services were gradually added to the responsibilities of the family planning field worker. Funding for this study was made possible through support provided by U.S. Agency for International Development/Bangladesh and the Office of Population and Reproductive Health, U.S. Agency for International Development/Washington D.C., under the terms of Award No GHS-A-00-08-00002-00 (Maternal and Child Health Integrated Program (MCHIP)- Leader with Associates Cooperative Agreement), No. GPO-AA-05-00025-00 (Associate Cooperative Agreement with the Access Program), No.GHS-A-00-04-00002-00 (Reference Leader Cooperative Agreement with the Access Program), and No. GHS-A-00-03-00019-00 (Global Research Activity Cooperative Agreement with the Johns Hopkins Bloomberg School of Public Health). The authors' views expressed in this publication do not necessarily reflect the views of the United States Agency for International Development, the United States Government, and/or the decisions, policy, or views of their respective organizations. The authors are grateful for the support and contributions of Dr. Ishtiaq Mannan, Angela Nash-Mercado, Robin Anthony Kouyate, Berengere de Negri, and Carla Blauvelt. The authors thank the study participants and field staff for their efforts in implementing the study and delivering the intervention, and the Ministry of Health and Family Welfare, Government of Bangladesh, for their support and collaboration in all phases of the study. Cite this article as: Ahmed S, Norton M,Williams E, Ahmed S, Shah R, Begum N, et al. Operations research to add postpartum family planning to maternal and neonatal health to improve birth spacing in Sylhet District, Bangladesh. Glob Health Sci Pract. 2013;1(2):262-276. http://dx.doi.org/10.9745/GHSP-D-13-00002. Ministry of Health and Population Control [Bangladesh]. Bangladesh fertility survey, 1975–1976: first report. Dhaka, Bangladesh: Government of the People's Republic of Bangladesh and the World Fertility Survey; 1978.
. Analysis of reproductive health conditions in USAID priority countries. Rosslyn, VA: Knowledge Management Services Project; 2012.
. The person and the situation: perspectives of social psychology. 2nd ed. Pinter & Martin; 2011.